Story by Lindsey Salestrom | Lincoln, Neb. 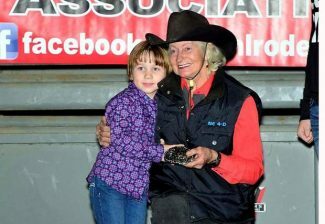 Average buckle winner June Holeman receiving her award from Jayelyn Ita, Thad's youngest daughter. Photo courtesy of JJJ Photo of Ord, Neb. 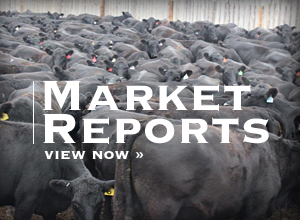 November 17, the University of Nebraska-Lincoln (UNL) rodeo team held the first annual Thad B. Ita Memorial Barrels and Bulls event at the Lancaster Event Center in Lincoln, Neb. There was 87 barrel racers and nearly 40 bull riders that turned out to compete for the prize money and award buckles up for grabs. The affair was open to the public with proceeds from the event establishing the Thad B. Ita Memorial Scholarship for UNL rodeo members. The Memorial Scholarship has been created in memory of Ita, Jake Ita, and wife Tricia, who died tragically in a car accident May 30, 2009. Thad Ita was a student in the College of Agricultural Sciences and Natural Resources at UNL. He was active on the rodeo team and competed in the bull riding in addition to being an officer for the team. Aside from the rodeo team, he was involved with the horse judging team. Combing the skill he learned on each team, Ita later evolved his rodeo career into becoming a rodeo judge. He had also frequented the Bullriders of America circuit and was a production crew member for the Extreme Bull Riding Tour. Sadly, Thad, his wife, Tricia, and son, Jacob, were killed in a head on car crash near Broken Bow, Neb., in the spring of 2009. His daughter Martina, age 10 at the time, was transferred to Creighton Medical Center in Omaha, Neb., where she recovered from her injuries. Then 19-month-old Jayelyn had also been in the car, but was not harmed. Ita's other daughter A.J. was not in the car at the time of the accident. To honor Ita's memory and contributions to the UNL rodeo program, the barrels and bulls event was developed to produce a scholarship in his name. 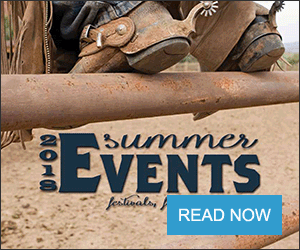 A $1,000 purse was rounded up to offer in both the barrel racing and bull riding events, along with buckles to the average winners. A.J., Martina, and Jayelyn Ita were on hand to present the buckle to the winning barrel racer and bull rider, along with other members of the Ita family. The event got into gear Friday night at Uncle Ron's Wild West Saloon in Lincoln, Neb., with a Calcutta to auction off the Bull Riders. The bull rider who won the first round of the bull riding on Saturday night won the claimer 25 percent of the total sale proceeds. Another 25 percent was paid to the person who bought the name of the bull rider who won the short round, and another 25 percent was paid to the person who bought the name of the bull rider who won the average. The remaining 25 percent of the auction proceeds went towards the Thad B. Ita Memorial Scholarship. Due to the abundance of barrel racers, the long round started at 2 p.m. Saturday afternoon, ahead of the bull riding event. The race was ran as a 4D format with the top 10 finishers in each division or 'D' coming back for the short go, which was ran in conjunction with the bull ride that started at 7 p.m. $700 added money was dropped into the long round pot, with $300 added money going to the short go. The race was co-approved by the NE4D association and the Mile Hi Barrel Association. After the go rounds were finished, previous National Finals Rodeo (NFR) qualifier June Holeman came out on top, winning the average buckle with a combined time of 30.229. Close on her heels was Annie Hasselbalch, of Bennet, Neb., with a combined time of 30.354. Rounding out the top 10 in the average were: Julie Strode, 30.42, Felicia Brazda 30.642, Nicole Finkner 31.024, Lindsey Salestrom 31.066, Joanne Hoffman 31.075, Annie Hasselbalch (2nd horse) 31.098, Kenzie Wolfe 31.211 and June Holeman (2nd horse) 31.258. In the bull riding, 35 riders contested the Double S Bulls provided by stock contractor Brad Vogele. Similar to the barrel racing, a long round was established for all entries to compete. The riders were split into two sections and those who covered their bull would determine who would make the short go. After the dust settled, and both rounds were completed, Pat Geipel of Elbert, Colo., was crowned the victor. After receiving his average buckle from the three Ita sisters, Geipel humbly gave the buckle to Thad Ita's mother.